Tired of escaping the city just to be surrounded by dozens of other campground dwellers? 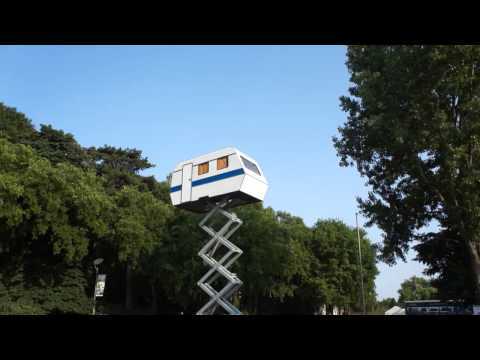 French artist Bufalino Benedetto has the solution with his scissor-lift camper. Titled "La Caravane Dans Le Ciel," or "Caravan of the Sky," Benedetto's creation hydraulically elevates itself several stories above the earth for a penthouse view of any destination. Sadly, it's more a work of art than functioning trailer. The camper is hollow. But it does give a person ideas.